Please find more information on our homepage. CR- Catherham CR3, Coulsdon CR5, Croydon CR0-CR9, Kenley CR8, Mitcham CR4, Purley CR8, South Croydon CR2, Thornton Heath CR7, Warlingham CR6, Whyteleafe CR3. 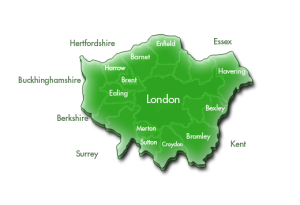 HA- Edgware HA8, Harrow HA1-HA2-HA3, Northwood HA6, Pinner HA5, Ruislip HA4, Stanmore HA7, Wembley HA0-HA9. KT- Ashtead KT21, Addlestone KT15, Cobham KT11, Chertsey KT11, Chessington KT9, East Molesey/West Molesey KT8, Epsom KT18-KT19, Esher KT10, Kingston KT1-KT2, Leatherhead KT22-KT23-KT24, New Malden KT3, Surbiton KT5-KT6, Tadworth KT20, Walton On Thames KT12, Byfleet KT14, Worcester Park KT4. TW- Ashford TW15, Brentford TW8, Egham TW20, Hampton TW12, Hounslow TW3-TW4-TW5-TW6, Isleworth TW7, Feltham TW13-TW14, Richmond TW9-TW10, Shepperton TW17, Staines TW18, Teddington TW11, Twickenham TW1-TW2.